It’s the most wonderful time of the year! 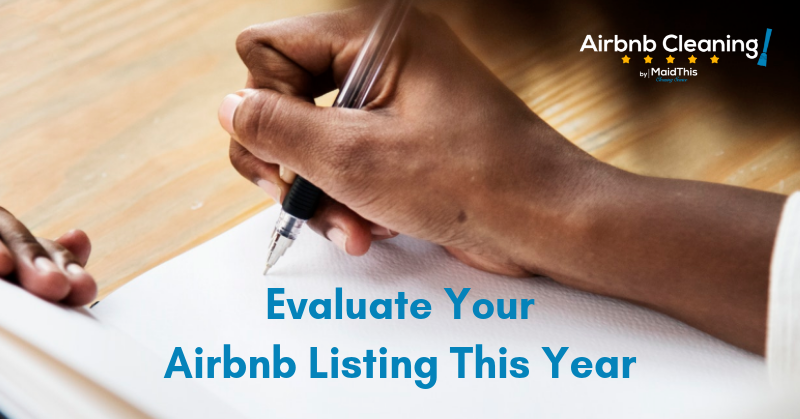 And you know what that means… things are coming to a close and there’s no better time to evaluate your Airbnb business and make plans for 2019. Even if you’re not a fan of personal reflection or goal setting, keeping close tabs on your business performance is important if you want to earn more in the new year. Whether you had a stellar 2018 or feel like there’s room for improvement, we’ve got a few suggestions to help you on your way. Like all good year-end evaluations, it’s important to take a look over the time that has passed. Grab a sheet of paper and draw a line down the middle. Label one side “Plus” and the other “Minus.” Now get real about your year. Be honest. What went well for your vacation rental business this year? What were you excited about? What brought you down or disappointed you? If nothing else, physically write down at least one thing that you consider the “highlight” of your hosting year and one thing you consider the worst. Hang on to that as you prepare for the new year and new season. Look over your reviews – both written and received. What kind of guests did you attract this year? Were you pleased with the folks who stayed at your place? This is a good time to look over your guest year and remember the highs and lows. Which reviews were you especially proud to receive this year? Try singling out 2 or 3 from the pack and look closely at your guests and what they wrote about their experience. What was it that made their stay so great? Now do the same with some negative or not-so-fantastic reviews from this year. Of those 2 or 3, what went wrong or wasn’t up to scruff? What could you have done differently, if anything? Again, be honest: Was it a situation where you really did everything you could or could you have extended a little more to keep your guests happy? Then, look over and think about the reviews you wrote this year. Which ones stick out in your mind? Choose 2 to 3 positive reviews and 2 to 3 negative reviews. Looking at those negative reviews, what could you have done on your end to avoid having those outcomes? This can be a difficult exercise because often, we feel all the blame should be on the guests’ side. However, it’s important to do some real soul searching to ensure you’re identifying every area where you can stand to make improvements – no matter how small. Write out a few goals. Yes, actually write them down somewhere that you’ll see them a few times a week at the very least. There is something so powerful about writing down your goals. In fact, according to studies, you’ll be 1.2 to 1.4 times more likely to achieve your goals if you write them down and see them from time to time. Look at the lists you’ve compiled on that paper of “Plusses” and “Minuses” and take a few moments to think about how you want 2019 to go. Write down 3-5 goals you want to achieve in your business and then do it! Work hard toward these things and check in with yourself regularly to see where you’re making it happen and where you’re falling short. Make 2019 your best hosting year yet. We’re cheering for you!